The main use case is backing up openHAB configuration and log files to a version-able cloud space and transporting changed files back to openHAB after editing them with the openHAB Designer on the administrator’s desktop PC. This service can be configured in the file services/dropbox.cfg. * In order to authenticate with Dropbox, the configuration must include either the personalAccessToken or BOTH the appkey AND the appsecret. The personalAccessToken is the newer method of authentication, and is a simpler process, but the appkey/appsecret method would theoretically work if configured. If all three properties are defined in the configuration, the personalAccessToken method will be used and the others ignored. fakemode false No operates the synchronizer in fake mode which avoids sending files to or from Dropbox. Set to true as a test mode for the filter settings. uploadInterval 0 0 2 * * ? No a cron expression to set the schedule for uploading changes to Dropbox. The default schedule uploads changes every day at 2am. downloadInterval 0 0/5 * * * ? No a cron expression to set the schedule for downloading changes from Dropbox. The default schedule downloads any changes every five minutes. BIDIRECTIONAL - files will be synchronized from Dropbox to your local openHAB and vice versa. All changes will be downloaded from Dropbox to your local system first. After that any local changes will be uploaded to Dropbox. Hence a concurrent change to one file will be overruled by Dropbox in any case. In case your Dropbox returns the reset flag, all local files will be uploaded to your Dropbox once, even if your synchronization mode is set to DROPBOX_TO_LOCAL. The reset flag might be returned either if the synchronization has been the first call ever (so no delta cursor is available) or there might be technical issues at Dropbox which causes the connected clients to resynchronize their states with Dropbox again. An app must be created on Dropbox. This tutorial also contains a video of the process. To eliminate this error, delete the deltacursor.dbx file. It should be in the same folder as the openHAB startup scripts. This is a three-step process. openHAB requests a token which is used as a one-time-password to obtain an access token which will be used for all future requests to Dropbox. # Dropbox-Integration: U S E R   I N T E R A C T I O N   R E Q U I R E D !! 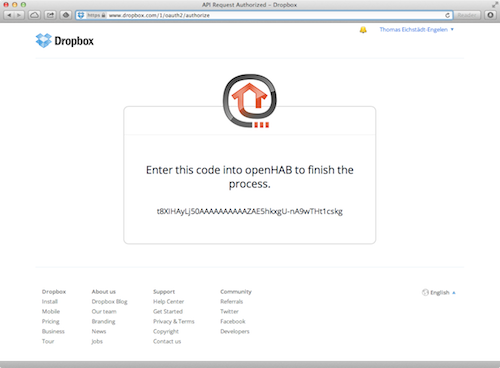 Copy the given URL to your browser and authorize openHAB to use Dropbox in the future. Be aware that the request token is only valid for the next five minutes. The default password is habopen. If this is the first time accessing your console, it may take some time to generate cryptographic keys. dropbox:finishAuthentication "replace with the token"